Welcome to philosophy.org.za! This website is a free, non-profit, online resource for studying philosophy at a graduate level, aimed at those who may already have an interest in philosophy but never pursued a systematic study of the subject. Here you will be able to work through as many (or as few) topics at your own pace and at no cost. Because philosophy.org.za is hosted privately and is not affiliated with any institution, we can focus exclusively on the task at hand: making philosophy accessible and interesting. Aesthetics – beauty and artistic appreciation. Icon or cliché? 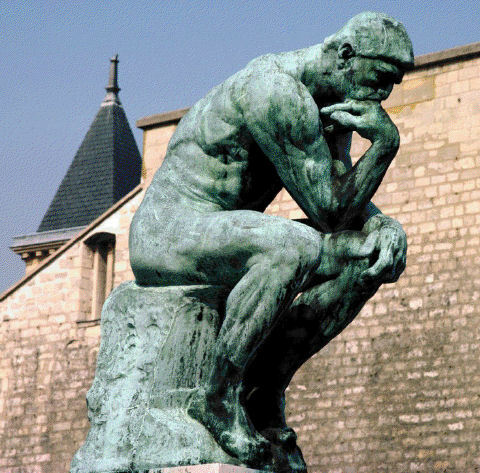 The Thinker (Le Penseur,) bronze, by Auguste Rodin. Note the figure’s musculature and heavy head supported by a flexed arm and wrist, suggesting that thought is an effortful activity. Then there are the numerous, important, derivative Philosophies of special interest, where the methods philosophical enquiry are employed in examining specific questions or even entire disciplines. These include, amongst others: Philosophy of Science, Philosophy of Mind, Philosophy of Language, Philosophy of Law (Jurisprudence,) Philosophy of Religion and even Philosophy of Philosophy (or Metaphilosophy.) Indeed the tendency to “go meta” (from the Greek preposition μετά for "after", "beyond", "adjacent" or "self") in regarding concepts, disciplines, even our own lives, from some level of abstraction, often self-referential, is a hallmark of philosophical thinking. Then there are the numerous important derivative philosophies of special interest, where the methods philosophical enquiry are employed in examining specific questions or even entire disciplines. These include amongst others: Philosophy of Science, Philosophy of Mind, Philosophy of Language, Philosophy of Law (Jurisprudence,) Philosophy of Religion and even Philosophy of Philosophy (or Metaphilosophy.) There are also various “Schools of Philosophy” which this website will deliberately eschewed, however we will follow a broadly Analytic Tradition which is continuous with Science. Why does Philosophy matter? For many people Philosophy does not matter to them and never will; however the fact that you have read beyond the first paragraphs so far probably means that Philosophy does matter to you, though you may not know why or have thought about the question in a systematic way. 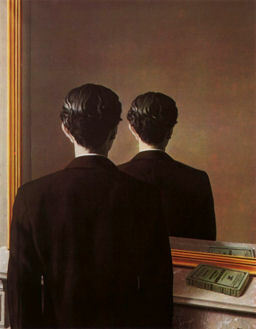 Not to be Reproduced (La reproduction in-terdite) a portrait of Edward James, (oil on canvas) by René Magritte, 1937 - an epitome of surrealism often invoking questions of meta-cognition i.e. thinking about thinking. In the following example, Plato and Aristotle suggest that Philosophy begins in awe or wonder. In the Theaetetus (155 d) Plato puts the following words in the mouth of Socrates when he observes, "I see, my dear Theaetetus, that Theodorus had a true insight into your nature when he said that you were a philosopher, for wonder is the feeling of a philosopher, and Philosophy begins in wonder." Later Aristotle, a pupil of Plato for many years, endorses the same sentiment in his Metaphysics (982b12) that, "It was their wonder, astonishment, that first led men to philosophise and still leads them." If you have ever been in awe of the grandeur of the Universe, the majesty of Life, the power of the human mind to create and comprehend, as well as our capacity to destroy; whether there are any other such minds, different from our own; indeed if you have ever wondered why there is something rather than nothing, seeming order rather than chaos, or any meaning at all in a meaningless world or why we are ever altruistic towards strangers rather than always selfish, then you have already been pondering some of Philosophy’s enduring questions. In another oft cited quotation from Plato’s Apology (38a) Socrates clams that: “The unexamined life is not worth living for a human being.” To the best of our knowledge, humans are unique in being capable of reflecting on their lives: “Is my life authentic? Do I really know what I believe to be true? Do I act ethically? Am I happy? If not, in either case, what would make me so?” These are questions that should concern everybody, not just philosophers. Our website logo is taken from the ancient Greek silver tetradrachm coin at left, equivalent to 4 drachmae. In wide circulation from 510 to 38 BC it bares the image Athena, virgin goddess of wisdom, obverse and that of Athena’s owl Glaucus, reverse a symbol of wisdom and vigilance. The inscription "ΑΘΕ" is an abbreviation of ΑΘΕΝΑΙΟΝ – of the Athenians.